As travelers there is really no end to the list of amazing places we want to visit. In fact, just recently I have had Greece on the mind and immediately upon researching I have decided that a boat trip around the Greek Isles is in order and the sooner the better. Once you decide on Greece the islands rapidly come to the fore front of what you want to see. But there are so many options, so many different islands, how on Earth could anyone choose? Do you visit multiple islands or just hunker down on one? So many questions. If you are looking for information on planning your Ionian Island holidays, look no further. I've done at least some of the legwork for you. There are 7 major islands in total. You can do them all in one mega sailing trip or spend a week on just one soaking up the culture and beauty. No matter which you choose I am sure it will be an amazing trip but just to simplify your decision making I put together a little guide of information on each of the major islands. The largest of all the islands, Kefalonia at 300 square miles is one of the most interesting to visit and definitely one of the islands that you could spend an extended period of time on. It is home to beautiful mountains, lakes, caves, lagoons, and beaches. Something for everyone. Some must see spots to visit are Mellissani cave, Myrtos beach, and Mount Ainos. You can swim, cave, kayak, climb, hike, or just bask in all the beauty. If animals are your passion you'll want to at least stop here as Kefalonia is home to a huge population of Loggerhead turtles as well as the endangered Monk seal. This island would definitely be our first pick! Corfu is the 2nd largest of the islands and also includes many small satellite islands. It is all of 33 miles long and 15 miles across so of course "large" is relative. There are mountain ranges, old cities, modern towns, and of course one fabulous beach after another. The old city is also a UNESCO world heritage site, making the cities architecture one of the things that draws in people most. If history is what you are after this is most likely the island for you. Corfu is rife with Greek history going back to the Greek mythology we all read about as teens. The history on the island is also full of battles and conquests leaving behind castles to explore. Two of them surround the old city making even a city walk fascinating. Zante or Zakynthos is the 3rd largest of the islands and is located off the West coast of Greece. It was named after an Arcadian chief and like so many of the other islands enjoys quite a bit of historical perspective. Each island is known for something, either being good for partiers or families, but Zante is unique in that it really can suit a bit of both! Be sure to check out the Blue caves, shipwreck beach, cape Skinari, and Agios Nikolaus beach. You can do everything from sunbathing to scuba diving, and base jumping to turtle spotting. Be sure to keep your distance from the turtles though, they are endangered and getting to close will land you a large fine. Paxos is one of the smallest and least visited islands. It is only 8 miles long so really can be explored in a short amount of time. One side of the island is covered in eroded chalky cliffs which give way to numerous blue caves perfect for exploration and seemingly the most amazing part of the island. If you are looking for solitude and beauty this is the spot for you! Lefkas is located on the Western side of Greece and is actually connected to the mainland via a long causeway and floating bridge. This makes it one of the easiest to access islands. It is also a rather large island at 22 miles by 9 miles. Here you can explore the beautiful Porto Katsiki beach, windsurf, and even take quick ferries over to visit neighboring islands. Ithaca is also located off the coast of Greece and is roughly 46 square miles. 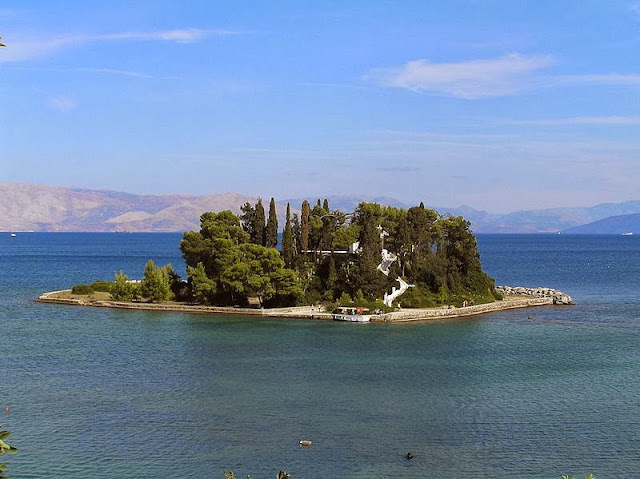 It can be seen from mainland Greece so it is fairly close and one of the easier islands to get to. The entire island is inhabited by only around 3000 people so natural beauty is still alive and well. This island is also ripe with history, starting with its famed connection to Homer's Ithaca which was the home of Odysseus. I don't know about you but I remember reading that in high school. I would love to explore the area and see if it really does match up. Apparently, that is up for debate! Be sure to visit one of the many monasteries on the island, rent a boat to explore the coastline, and enjoy some of the lovely beaches. Just remember some of the beaches are only accessible by boat hence the need to do at least a 1 day boat tour. Kythira is one of the smaller and less visited islands. It is conveniently located between the Peloponnese and Crete making it a nice spot to stop and relax between two larger destinations. If you choose to stop here be sure and visit the lighthouse of Moudariou, the cave of Agia Sophia, the islet Chitra, and the numerous lighthouses and watermills scattered around the island. So there you have it, a bit about each island. Now which one would you choose to visit?